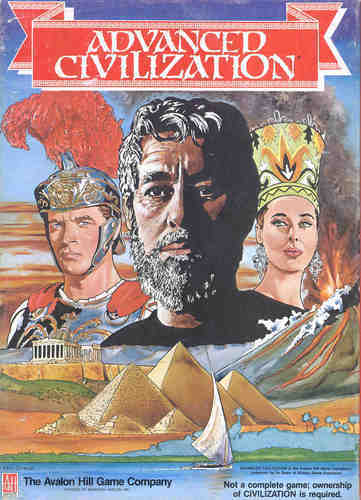 Welcome to (CIV), a web adaptation of the board game Advanced Civilization by Avalon Hill Games. Rewind back in time, thousands of years B.C. You find yourself in ancient Roman terrain, alone in a chaotic world without allies or money. It is up to you and your intelligent decision making to build. Trading goods for goods and becoming a nation of people that will live on to perservere. This world is up to you. Build ships to move to better soil. Trade your land's gems for iron so you can build your military prowess. Encourage power in numbers by inviting people to join your nation. Balance your talent, achieving the optimal variety of skill sets to succeed: artisans, merchants, warriors, farmers. Everyone is important. ...or you know what it takes to get anywhere in this world... 'alternative measures' ...work the system by manipulating others. 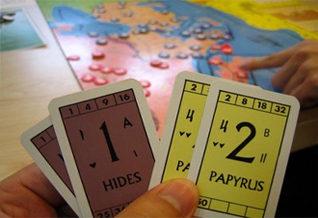 For more information on how to play and the rules of Advanced Civilization, please click here to view our help. Invest your assets. Save your goods. Watch out for Deception. Equip your domain with the right people with the right skill sets.